A wedding reception requires just as much planning as the wedding ceremony, perhaps more. You can create a plan of action to ensure your reception is everything you want and your wedding guests are happy and entertained. Before you book your reception location, decide whether you are going to have a theme wedding. If so, the theme will dictate virtually every other decision you make for the reception. A simple theme, such as a color or season, makes planning easy. More involved themes like the Renaissance will require careful planning. Once you have decided on a theme (or not), you can begin the rest of your plans. The theme also dictates the location you choose. For example, a western wedding theme is perfect for a reception in an old-fashioned barn, but not in a modern art gallery. Even if you don't plan an overall theme, you still need to look for a location that can support you general wedding style, whether it is contemporary or traditional. 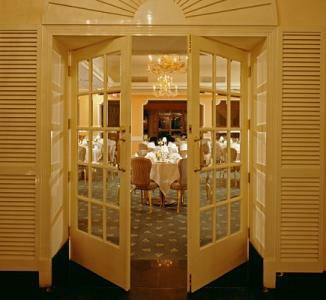 Book a reception banquet room early. Decide which businesses are going to be the vendors at your reception early in the planning process. You do need to have a basic idea of what you're looking for before you start booking your vendors. For example, know whether you want a modern or vintage wedding, or if you want it downtown or out in the country. Just a general idea will help you narrow down your choices when you start getting vendor quotes. Location: Popular reception locations can be booked for a year or more in advance. As soon as you find the right spot, put your deposit down. Most couples book their hall a year in advance or more. If you are planning a fast wedding, you can still find locations, but they may not be your first choice vendor or the first choice for your wedding date. Cake decorator: Again, the best bakers are often booked months or years in advance. At minimum, try to book the decorator three to six months before the wedding. Caterer: Like the cake decorator, the caterer should be booked three to six months before the wedding. Make sure all the details about each course are also clearly understood at the time of booking. DJ/Band: Bands and DJs with good reputations are often booked several months in advance. Make sure you hire yours at least three months before the wedding. Some vendors, such as the florist and photographer, are also used for the ceremony. Make sure your package includes everything you need from these vendors for the reception, too. Once you have the vendors booked for your reception, it's time to start planning the actual reception details. Work with each vendor to come up with some great ideas that stay in your budget and help you pull off the reception of your dreams. Water, punch and champagne are popular drink options at most weddings. Serve a delicious wedding cake for dessert, with a design that matches your theme, season or colors. The baker can give you plenty of wedding cake ideas from flavors to designs. At most wedding receptions, a wedding DJ or band plays songs for the couple, bridal party and guests to dance the night away. Often, the DJ or lead singer will serve as emcee of the reception, letting guests know when speeches will begin, the cake will be cut and when the last dance will be played. A DJ is typically cheaper than a band and offers more variety in music, but a band that specializes in your favorite music genre can be a lot of fun for music lovers. While dancing is still a popular activity, more and more couples are opting to have wedding reception games available, too. These are a great idea for more intimate weddings where a dance will seem over-the-top, but you still want to keep guests entertained. 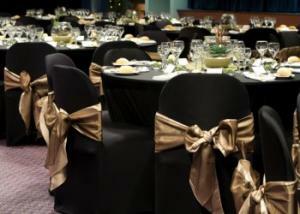 Decorations are what turn a simple hall or room into a fantasy wedding site. Create centerpieces, using candles, themed elements or flowers found in the wedding bouquets. Decorate with lights, using them on the head table, backdrop, to highlight columns or spotlight couples on the dance floor. 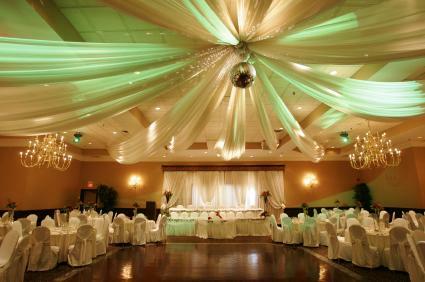 Add balloons to entrances and the dance floor ceiling for a budget-friendly decoration option. Decorate the dance floor with flanking columns and tulle criss-crossed above the floor. Wedding reception decorations will turn an otherwise simple garden, banquet hall or church basement into a stunning site for all your guests. Wedding reception favors are the way brides and grooms say thank you to their guests for celebrating their marriage. Place them in bowls near the guest book table or at each individual place setting. Candy wedding favors, cookie cutters, wine favors, seed packets and personalized shot glasses have also been popular choices for couples. Remember to attach a wedding favor tag with a short sentiment from yourself and your spouse expressing gratitude for their attendance. When you plan your wedding reception, you're planning what might be the most important party of your life. It's important you and your guests have a wonderful time. Come up with some reception ideas early and then put the ideas into place to make sure yours is truly everything you've dreamed it should be.